Three friends from a small Irish town have lived in London for the past 12 years. Kathleen leads a quiet, orderly existence as an accountant for an advertising agency. She’s happy on her own, believing that romantic relationships only lead to pain. Tara shares a flat with her boyfriend, Thomas, and works as a computer analyst. Thomas is an opinionated cheapskate who constantly badgers Tara about her weight, but hey, it’s better than being single and she really does love him (she just doesn’t like him very much). Of the three, the gay man Fintan is the happiest, with a fashion design career and a caring partner. Katherine is by far the most interesting and well-developed character. She is called the Ice Queen at by the men at her work, but she is doggedly pursued by her good-natured co-worker Joe, Katherine rebuffs him constantly until he stops his pursuit, and then Katherine realizes she is jealous when Joe begins to date another co-worker. Slowly, she releases the emotional baggage and wounds that have kept her distant for over a decade. By the end, she is by far the most settled character and her course of lie is set. Tara is a difficult character to like. Her live-in BF, Thomas is unlikeable in every regard, but her low self-esteem keeps her in the relationship. It takes her waaay too long to grow a backbone and drop the loser, but at that point the reader has given up on liking her. Fintan is alternating cheery, flamboyant and brooding. His battle with cancer mainly serves as an impetus for Katherine and Tara to change their static lives. 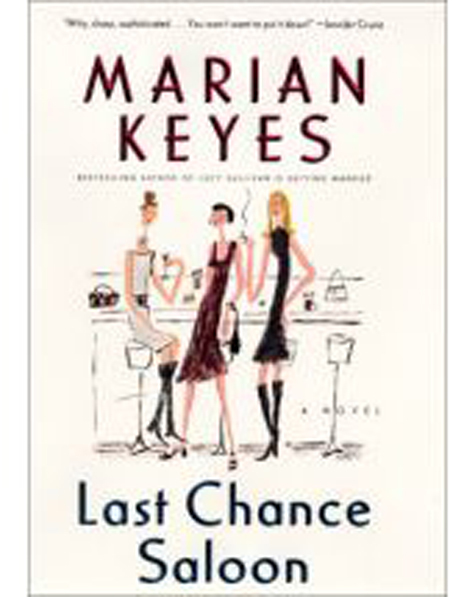 Irish-born Keyes is the most literate of the British slate of chick-lit writers; she also has the best sense of humor and her writing gets better with each book. Last Chance Saloon was Keyes’ first non-first person narrative, jumping between five different character viewpoints effortlessly. She seems to be on her way to inheriting the mantle left from the death of Maeve Binchy. Breezy, funny and not-too-annoying as chick-lit.